What does it take to be a kitchen kid? The recipe is really quite simple. Start by always putting safety first. Then, add an open mind and a will to learn. Sprinkle with a few kitchen spills. And finally, mix in a few great tasting ingredients, like Wisconsin cheese! 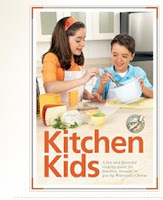 This Kitchen Kids brochure is a boon to the whole family. Fabulous recipes plus helpful cheese and cooking tips will provide great times and meals. Cookbook should arrive in 6 to 8 weeks.